Color is one of the most effective and least expensive ways to give a room or a whole house new life. Color is a tool that demands thoughtful consideration, so keep in mind…. *Cool and pastel colors make rooms feel larger and reflect more light. 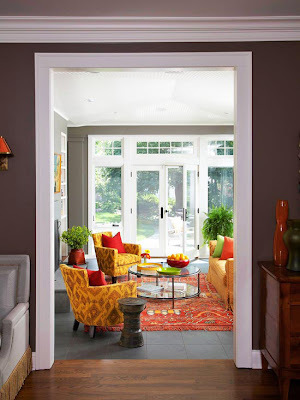 *Warm and bright colors are visually heavier than cool hues. to 2 or 3 hues in each room. Lighting used in a room plays a huge roll in how color is perceived. So be sure to check color choices under all lighting conditions. check throughout the day to see how the color changes with the light.